© 2008 FarmgirlFare.com, the award-winning blog where everybody knows that happiness is a warm puppy. And for those of you sharp-eyed sheep sighters, this little ewe is indeed a Katahdin hair sheep (tails aren't docked, no shearing required, not sure about the little horns sprouting from her head). Last spring we decided to diversify—I just haven't gotten around to telling you about it yet. I know, I know, along with about a zillion other things. And for those of you with really sharp eyes, I'm pretty sure that in the bottom photo this silly lamb is smiling. © Copyright 2008 FarmgirlFare.com, the award-winning blog where we find non-stop, all night, coyote-scaring barking to be sweeter than the sweetest lullaby that sends us off into a deep and peaceful sleep each time we hear it—but it's probably a good thing that our nearest neighbors are several miles away. © Copyright 2008 FarmgirlFare.com, the award-winning blog where yes, I did in fact name Marta after the main character in my second favorite movie (the first is "Out of Africa"), a quiet little German gem called "Mostly Martha" (pronounced Marta in German). I've watched this movie numerous times and think every single thing about it is wonderful, including of course that it's all about food. Unless you're trying to eat dinner while watching it, you barely even realize you're reading subtitles. Last week I took my chances and bought a used copy of the American remake, "No Reservations," despite it's poor reviews, since I love "Mostly Martha" so much and am a Catherine Zeta-Jones fan, but I turned it off before it was halfway over. I highly recommend the original! © Copyright 2008 FarmgirlFare.com, the award-winning blog where we've past our official October 15th frost date without any frost, though we often get frost even earlier since we're tucked down in this little valley. Colder weather is headed our way, and while the majority of our green tomatoes are already safely in the pantry (some will turn red on their own and the rest are headed for a batch of my salsa-like green tomato relish), we couldn't help trying for a few more vine-ripened red—and orange!—ones (the ones ripened off the vine won't have anywhere near as much flavor). Thanks to floating row covers and old bedsheets we toss over the plants at night, we're still enjoying a few more—and oh how we're savoring each one. Update: Okay, so between the time I wrote this last night and woke up this morning, the farm has been completely covered with frost. Tonight we'll have the last BLTs of the season for dinner (made with bacon from the locally raised hog we had butchered this summer and served on toasted homemade bread) while the woodstove keeps us toasty warm. What a delicious contradiction! Feeling Cozy & Safe - Or Just Continuing the Boat Theme? Like to see more lambies? © Copyright 2008 FarmgirlFare.com, the award-winning blog where we're gearing up for sheep breeding season 2008—which means lambing season 2009 is already on our minds (and will begin approximately five months after breeding season starts). Meanwhile here's a little look back at lambing season 2008—because cute baby lamb photos are always in season. 9/27/07: Made for Each Other? 9/28/05: It's Starting. . .
9/30/05: Name That Sheep Contest! You Could Win a Sheep! © Copyright 2008 FarmgirlFare.com, the award-winning blog where people often ask if our donkeys do anything besides look cute. The answer is sort of. The idea was that they would help protect the sheep by chasing off the coyotes, but as Joe puts it, now that we have a whole herd of donkeys, they pretty much just like to protect each other. They do eat a lot of weeds and brush that the sheep don't care for. And of course their entertainment value is priceless. Besides, you know how far cute goes in my book. Beat the heat with this simple and refreshing, healthy gazpacho that's packed with tomatoes, cucumbers, sweet peppers, onion, and garlic. It's funny how you can go so long without ever knowing about something, and then once you do you're instantly bombarded by it. That's what happened to me a while back with sherry wine vinegar. I'd never heard of it before, saw it listed in a recipe, and then suddenly it seemed like half the recipes I came across during the next couple of weeks were calling for the stuff—which I still haven't been able to find for sale anywhere (update: found some!). Then it was the phrase 'my bad.' I saw a book of cute animal photos called I'm Sorry. . . My Bad!, couldn't figure out the title, and the next thing I knew I was hearing my bad everywhere—including in a seven-year-old movie I'd already watched twice. Lately it's been gazpacho. Of course I was already familiar with this cold soup, but I'd never actually made or tasted it. Back in August I was served some during a Sunday brunch with friends, and after one dainty slurp I was hooked. "This would be the perfect thing to keep in the fridge all summer long!" I exclaimed, and immediately demanded the recipe. The hostess opened up a battered copy of Mollie Katzen's beloved New Moosewood Cookbook and proceeded to tell me how she'd personalized the recipe over the years, including stirring in a little yogurt and garnishing it with a dollop of sour cream. That afternoon the gazpacho flood began. I found a recipe for it sitting in my e-mail in-box when I arrived back the farm. And another one in a magazine I flipped through that evening. Gazpacho was suddenly everywhere on the web, too, and I discovered my foodie pal Finny had just whipped up a batch using tomatoes from her garden. On and on it went. I took this as a big red sign and dove in. Gazpacho is, according to this article in Saveur magazine, "the definitive Andalusian dish, and—with the possible exception of paella—Spain's most famous culinary export." I've also learned that it has approximately three million variations. The basic idea is that you combine bread, olive oil, and vinegar with some other ingredients (often fresh tomatoes and cucumbers), blend it up (or not), and serve the resulting mixture chilled. But just what are the other ingredients? During some quick research I found recipes that called for—are you ready?—all of the following things: tomato juice, V8 juice, fresh tomatoes, canned tomatoes, tomato sauce, stale bread, bread crumbs, cucumbers, green peppers, yellow peppers, red peppers, piquillo peppers, jalapeno peppers, chopped green chiles, radishes, leeks, garlic, celery, white onions, yellow onions, red onions, scallions, shallots, olive oil, vegetable oil, dry white wine, white wine vinegar, red wine vinegar, tarragon vinegar, sherry wine vinegar, lime juice, lemon juice, lemon zest, unflavored gelatin, green olives with pimientos, chicken stock, a beef bouillon cube, chipotle chiles in adobo, sugar, maple syrup, honey, Tabasco sauce, Worcestershire sauce, cayenne pepper, paprika, cumin, basil, oregano, tarragon, chervil, chives, cilantro, dill, ginger, parsley, yogurt, sour cream, fava beans, avocado, almonds, green grapes, crab meat, zucchini, and water. Water? The June 2008 issue of Martha Stewart's Everyday Food has a tropical gazpacho made with mangoes, cucumbers, and buttermilk. In The Silver Palate Good Times Cookbook, authors Julee Rosso and Sheila Lukins included a recipe for green gazpacho that calls for arugula, watercress, yogurt, and three raw eggs. In The New Basics Cookbook (one of my all time favorite cookbooks), Rosso and Lukins offer up a more traditional version and admit that they've been known to add a bit of vodka to their mugs "so that it becomes a Spanish Bloody Mary," which I thought sounded like a very good idea. Gazpacho garnishes ran from chopped tomatoes, peppers, cucumbers and onions to black olives and chopped hard-boiled eggs. Croutons were mentioned all over the place. Ultimately I decided to go the very simple route with both ingredients and technique. I've never understood the common practice of adding purchased tomato juice to gazpacho when you could just use more fresh tomatoes instead, which is what I did. I also skipped the traditional stale bread, went easy on the olive oil (one recipe I found called for 1½ cups! ), and used white balsamic vinegar because that was what I had on hand. There's no need to blanch, peel, seed, or force anything through a sieve in my version, and all of the vegetable goodness ends up right in your bowl. I wasn't trying for traditional, but I did leave out the gelatin, shrimp, and raw eggs. 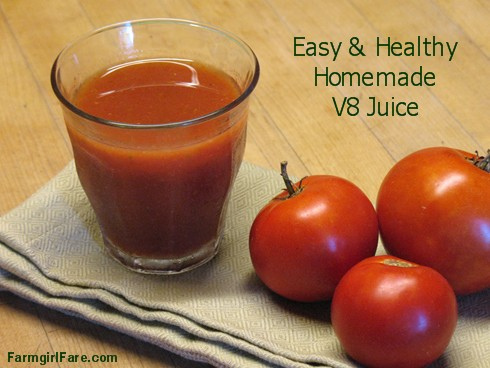 Besides being delicious, this gazpacho also happens to be extremely good for you. 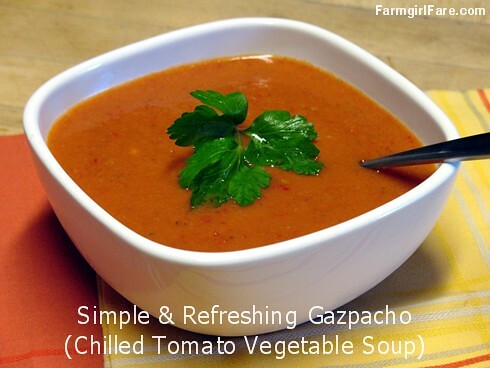 If you've never had gazpacho, I urge you to give it a try, even if, like me, you're not a big fan of cold soups. This recipe is basically a thick juice, which can be sipped rather than slurped—and easily made thinner—if desired. What do you like to put in your gazpacho? Some people refer to gazpacho as liquid salad. While flavorful, vine-ripened tomatoes are of the utmost importance here, this is a perfect opportunity to use up those not-so-perfect-looking specimens you might have hanging around. Make it a day ahead if you can, as the flavor increases dramatically after sitting overnight in the fridge. Weighing your ingredients makes things so much easier, especially when you're dealing with the often disparate sizes of fruits and vegetables. As always, I urge you to seek out local and organic ingredients; they really do make a difference. Combine all ingredients in a large bowl. Using a counter top blender, purée the vegetable mixture in small batches until smooth. Combine and stir well. Adjust seasonings to taste. Let sit for several hours or overnight in the fridge. Serve chilled, with a little yogurt stirred in and/or a dollop of sour cream on top if desired, along with any other garnishes you like. This gazpacho will keep for three to four days. © FarmgirlFare.com, the fresh picked foodie farm blog where the mornings may be nice and nippy (hooray for polar fleece season! ), but our late-planted tomatoes and cucumbers in the kitchen garden are just now at their peak, and since putting up portable electric fencing is still hot and sweaty work even if it is only in the 70s outside, I see at least one more batch of refreshingly cool gazpacho being whizzed up in our early October future.